USSR experimented perhaps more than any nation the concept of airborne armored warfare. This was born from the tactical school of “deep battle” revisited and modernized after the “great patriotic war”, and refined during the cold war. The BMD-1 (1969) was the first airborne IFV to be built, judged more satisfactory that simple open-air tankettes like the ASU-57 or the airborne tank hunter ASU-85. It was replaced by the visually similar BMD-2 in 1985, which was a bigger machine altogether, much heavier (11.5 tons vs 7.5 tons) and larger. For the third generation of the type, Volgograd tractor factory design bureau designed a new, heavier vehicle centered around the same turret as the BMP-2, with a modified crew compartment, taking lessons from the Afghan war which showed that a two-man turret was way better in operations. Studied came out in 1985 as the Object 950. Six prototypes were built in 1985-86, tested and refined, and the BMD-3 entered in service and standardized production in 1990 with the VDV, just during the collapse of the Soviet Union. In 1981-82, two options for the VDV were studied, on the same time frame that the BMP-3 which showed that only one could be transported by an Il-76 transport plane. The first option was to replace the ASU-85 and obtain a compromise tank-IFV armed with a 100 mm 2A70 rifled gun and a coaxial 30 mm 2A72 autocannon (the whole weighing over 18 tonnes) or to adopt the BMP-2 combat module with its 30 mm 2A42 autocannon. In that case, the weight could be decreased to 12.8 tons and three could be loaded inside an Il-76. The Council of Ministers of the USSR and the CPSU number 451-159 decided over the preliminary studies to favor the second option, and work started at the appointed Volgograd tractor factory (VgTZ) under the name code “Bakhcha” on May 20, 1983. Building on the experience gained on the BMD-1 and “Object 934” light tank, three prototypes were built in 1985 and three more in may 1986 to detect and correct numerous technical deficiencies and an excess weight of 190–290 kgs. The new prototypes still were in excess of 400 kgs but the problems with the running transmission gears were fixed. State tests took place between 27 October 1986 and 27 October 1987, then two vehicles passed a series of climatic zones tests in 1988. 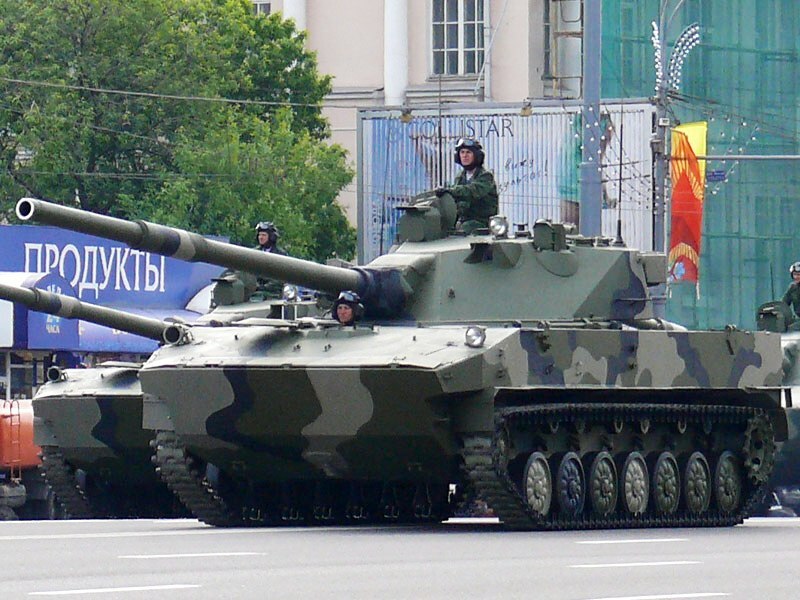 The Object 950 was eventually accepted and standardized on 10 February 1990 for production, which began slowly, with only five vehicles in 1990, 25 in 1991, and consequently because of the collapse of USSR and disruption in the supply of parts, even finances, production was marginal at 15 in 1992, 27 in 1993, 35 in 1994, 15 in 1995, 9 in 1996, and only 6 in 1997. With the exclusion of the prototypes, 137 vehicles were built. However, there are plans to launch a sizeable production of the upgraded BMD-4M. The BMD-3 was still a cold war design, largely inspired by the BMD-2, but with a main difference. It was using the turret of the BMP-2 for commonality of parts, training, and because of the good performances of the 30 mm 2A42 autocannon. The steel turret was also much roomier and could be operated by two men. Like the previous vehicles, the hull was made of welded aluminum alloy to save weight. Protection was maximal against heavy MG rounds on the front and turret (around 12-13 mm) and sufficient against small arms fire and splinters on the sides and rear. There were an automatic fire extinguisher and over-pressurized NBC protection. In addition, the turret had two banks of three 81 mm smoke dischargers to provide IR protection. A smoke screen can be obtained by injecting diesel fuel into the exhaust. An ERA protection kit (of French type) was later provided but rarely used due to the danger for the nearby infantry with such system. At the front, the driver (center), vehicle commander (behind, right, with cupola), and gunner (left) took place, with four seated infantrymen in the center compartment. Two of them are provided with hatches and pistol ports. The upper rear compartment is reserved for the storage of extra ATGMs, ammo and the filter-ventilation unit. But in case of emergency, this can be jettisoned, for an extra accommodation of 8 soldiers in total. The 30 mm 2A42 autocannon could fire at 200/300 rpm with a muzzle velocity of 960 m/s at 2000 m range. It could fire on the move due to a 2E36-3 weapons stabilizer (elevation & azimuth). Thanks to a 75° elevation the main armament can be used against low-flying aircraft and helicopters. It could fire armor piercing-tracer and high explosive-incendiary rounds. It is coupled with a PKT LMG, both served by a BPK-1-42 combined sight type. Secondary armament comprised a 30 mm AGS-17 grenade launcher with 500 rounds for infantry support (front left, bow), a 5.45 mm RPK-74 machine gun (front right, bow) to deal with infantry (2600 rounds), and a 9M113 Konkurs (NATO AT-5 Spandrel) ATGM. The latter can be swapped for a Fagot (NATO AT-4 Spigot) thanks to a common 9P135M launcher. The launcher has 3 ready-to-use missiles plus 2 stowed inside the vehicle. The practical range of the Fagot is 2000 m to 2500 m on the Fagot-M (able to defeat 550 mm of RHA) and 4000 m for the konkurs (750–800 mm of RHA, doubled on the Konkurs-M tandem warhead). There is also an option to fire NATO’s MILAN. The engine, main clutch, gearbox, final drives and brakes are located to the rear compartment. The drivetrain comprised five standard lightweight hollow roadwheels, four return rollers, rear drive sprocket and front idler, per side. The suspension is individual and hydropneumatic, with a hydrostatic steering mechanism providing a ground clearance ranging between 130 and 530 mm, and allowing an extra elevation/depression if needed. This allowed the tank to be fastened more easily on a platform for paradropping. Thanks to a 2V-06-2 water-cooled diesel engine which develops 450 hp (331 kW), the Power/weight ratio is of 34.9 hp/tonne (25.7 kW/tonne), and top speed of 70 km/h (43 mph) on paved roads, 45 km/h (28 mph) off-road. It is 10 km/h (6.2 mph) when swimming. In this case, propulsion is assured by two waterjets, and it can take damage when swimming, still buoyant even being 30% filled, and equipped with pumps. The maximal range is 500 km (310 mi) on flat. Tests revealed it could climb a 60% gradient or 30% side slope. BMD-3K The command version adopted in 1996 but never produced. 2S25 (Object 952) Self propelled gun in service by 2005, armed with a 125 mm 2A75 smoothbore gun with a 500 hp engine and 6 roadwheels per side. Production unknown. BTR-MD “Rakushka” (Object 955) multi-role, modular transport vehicle in development. The derived BTR-MDM is based on the BDM-4M. 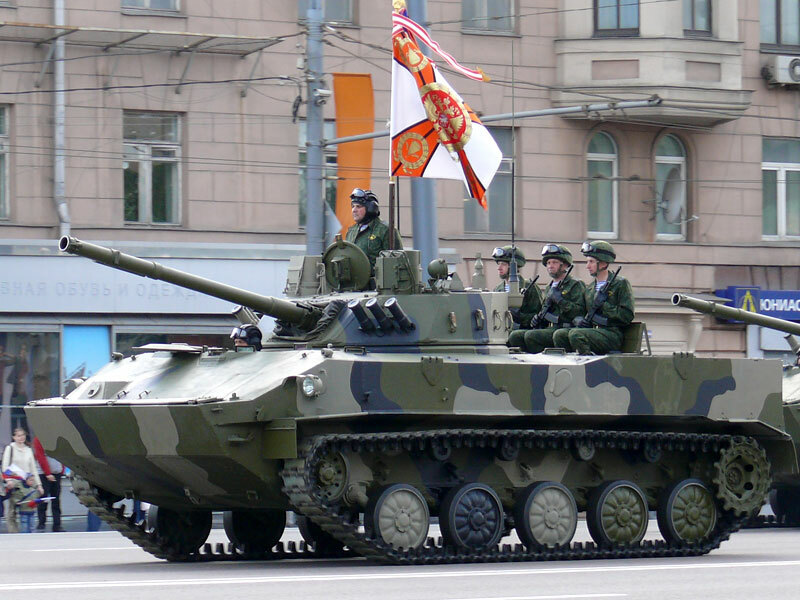 RKhM-5 (Object 958) Chemical reconnaissance vehicle introduced in 2011. 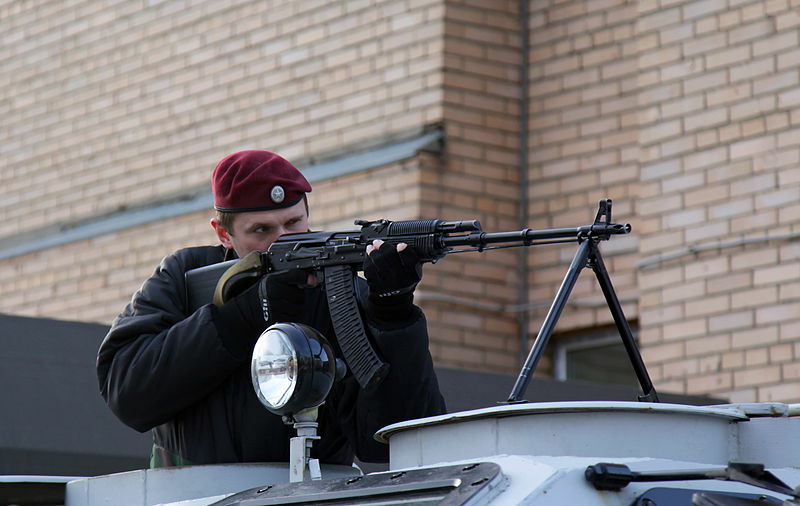 Turretless, with the same equipment as the RKhM-4 (BTR-80). Tested in 2012. BMM-D Command and ARV version, lengthened (7 roadwheels), 510 hp engine (2S25). In development. Started as an improvement over the BMD-3 (BMD-3M) it was later called BMD-4. It has a modified chassis, the new “Bakhcha-U” turret common to the BMP-3 with a 100 mm 2A70 rifled main gun, 30mm 2A72 autocannon, 7.62 mm coaxial LMG and the new “Ramka” FCS as well as a bow-mounted AGS-30 RL. A small production/conversion of BMD-3 was followed by the BMD-4M: New chassis, 500 hp UTD-29 engine (BMP-3). Production by Kurganmashzavod (KTZ), first presented in March 2008. After evaluation in August 2011, adoption was confirmed in 2012. USSR: Only a few (see production), passed to Russia. 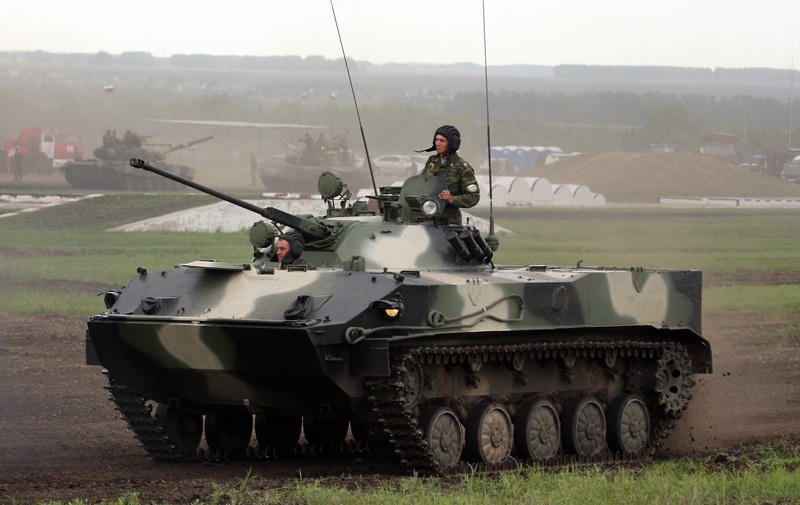 Russian Airborne Troops are equipped with 100 BDM-3s as of 2012, and perhaps 60 BMD-4, while the BMD-4M entering full scale production and service today. The remainder could be either converted to BMD-4 or exported. Indeed, apart Russia, Angola apparently received some vehicles in 2012 (“Angolan army ground forces military equipment” July 2014). The BMD-3 was not battle tested yet. The VDV plan to acquire 1,000 BMD-4Ms by 2020 so the BMD-3 looks like a transition vehicle. 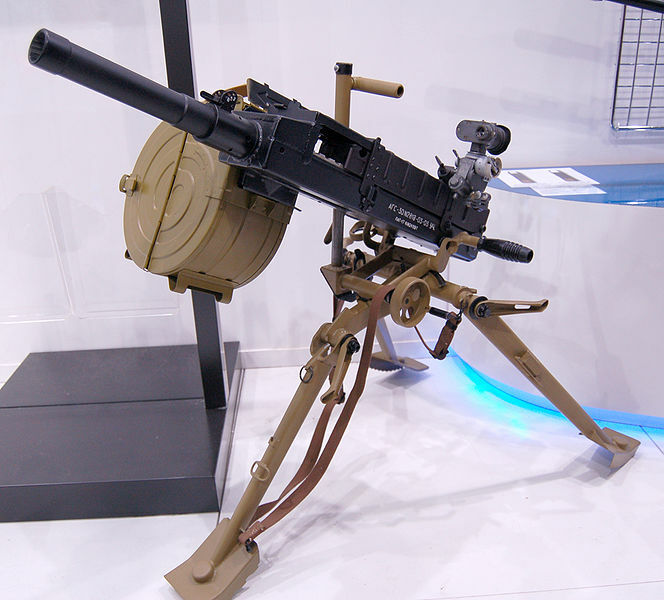 9M113 Konkurs ATGM (4 reloads), 30 mm AGS-17 grenade launcher. BMD-3 in the standard 3-tones summer/spring pattern. 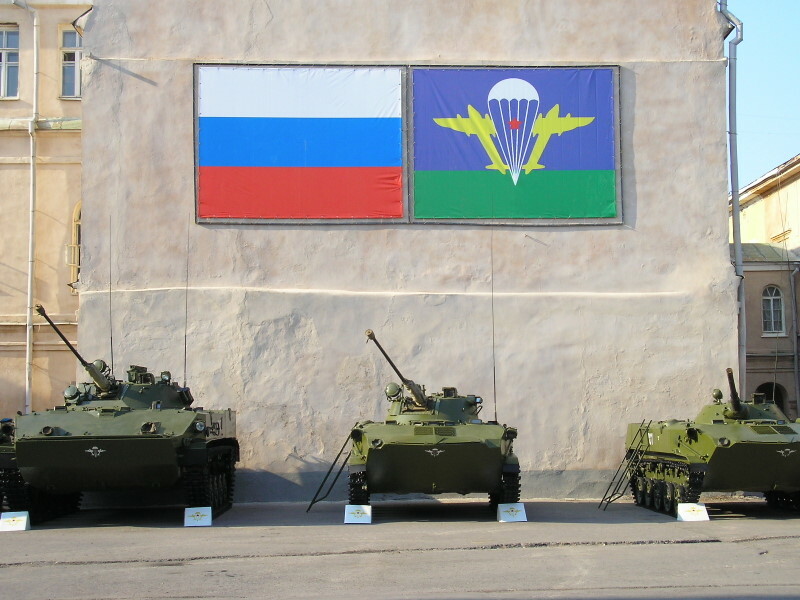 BMD means “Боевая Машина Десанта”, Boyevaya Mashina Desanta or “Combat Vehicle of the Airborne”. It is showing the winter grey variant of the regular 3-tone pattern. 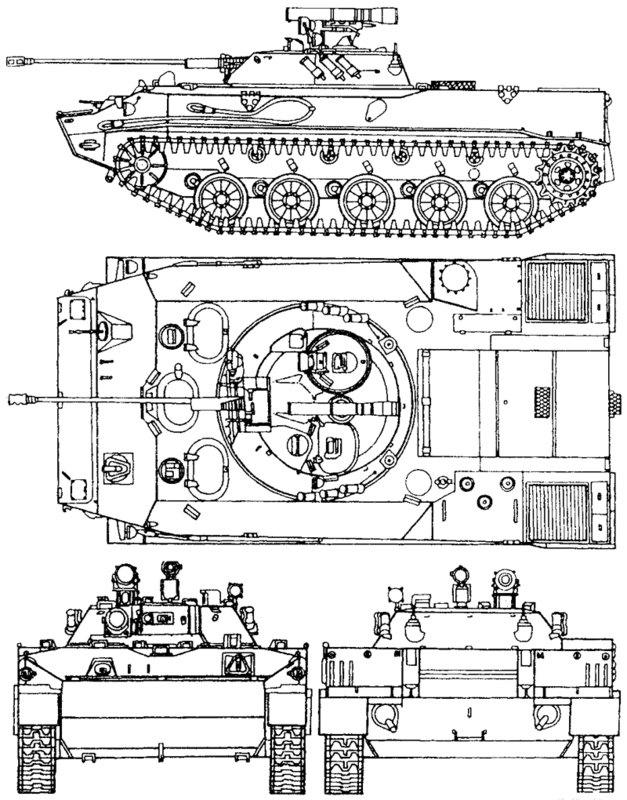 Sorry, but more than a comment (which by the way I have already written) I have a question: Is it possible to find a 3view drawing of a BMP-3 Dragun 125?? or of a 2S25 Sprut SD? I would like to assemble a model of one of those two vehicles. Can you help me?? Hello Gottardi, we are sorry, we don’t have any such drawings as of yet.